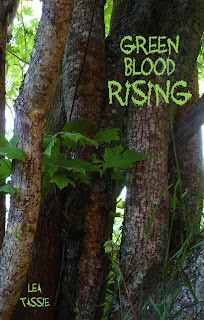 Lea Tassie, Green Blood Rising. Smashwords, 2012. Pp. 239. ISBN 978-0-9864709-5-0 (e-book)/978-0-9864709-4-3 (print). $2.99/$16.00. 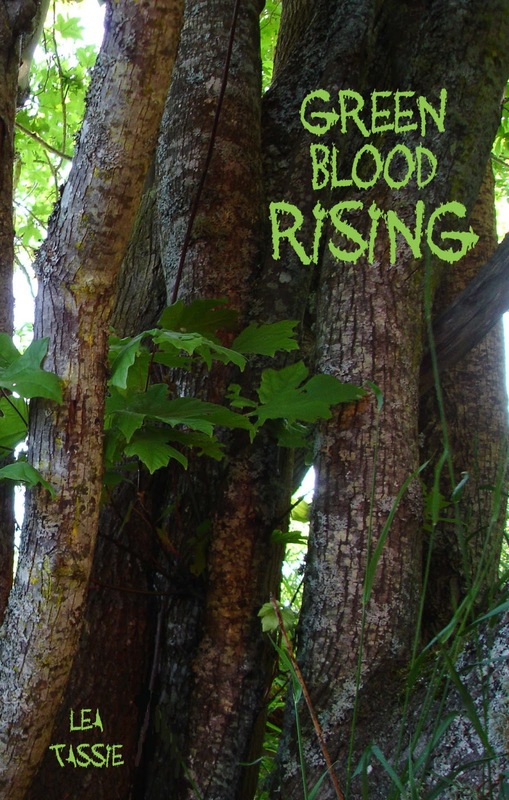 In a tale of ecological threat, for the protagonists of Green Blood Rising, the world ends not with a bang of explosive force, but the soft, quiet sound of trees, growing fast and far beyond their natural rate. This book merrily follows in the tradition of more ‘intimate’ emergencies, following a select group of people through a major upheaval; a trend begun with the founding fathers of ‘sci fi’ in the 1890s. The themes may relate to far wider concerns, but the action centres on just a few individuals, and there is much explication—the science in the fiction as important as the drama of the events. There is a considerable amount of explication in this book, rather than being simply an emotional roller-coaster ride. It harks back to a subtler style of slowly increasing menace and creeping unease. For the danger comes not from the ‘threat’ (vegetative overgrowth disrupting human society), but the reactive panic and violence that the fall of society triggers. The real threat is human in origin, and remains so. It also belongs to the sub-genre of ‘nature has turned.’ Whereas a lot of doom-laden apocalyptic scenarios rely on bombs, wars (again, the human threat), these present a blasted world on which humans scrabble to survive. This time it is the solid overgrowth of trees that brings society to its knees in a world rendered a great deal more green and pleasant than before. And one cannot escape Tassie’s implicit commentary on the fragility of modern life, divorced as it is from the natural world and its resources. With transport down and food lines disrupted, life on Vancouver Island, British Columbia, as well as odd reports from further afield, inserted in as the characters learn them, show that the world—human society, that is—is going to hell in a hand-basket. There is little ‘bang for buck’ in here, but there is well-informed, descriptive writing that aims to get the reader into the minds and hearts of its characters and have us feel along with them, instead of being distanced by excessive, surface excitements. What they know, we know, and no more; there is a pervading sense of the global world collapsing in size to the small community. Parts of the chapters are made up from the journal of the family’s mother, expressing her fears and her moral difficulty in coming to terms with the possibility of fighting and shooting other humans to defend the family. It is true: sufficient food and a veneer of ‘civilised’ life and there is room for the luxury for moral outrage and ethical debate. Expressing the human animal in her, however, the writer finds it less academic and becomes more ‘pro’ on the death of a family member at the hands of an attacking gang. In a not-too-distant future (the story starts in 2050), most of the world’s old forests are gone, to make way for homes and land. Despite plantations of new trees, the Western economy is seeing the beginning of the end for logging and paper production, leading to social unrest. At a stand of old trees in British Columbia, Canada, a logging company discovers that the trees are fighting back; electrical charges spiking from the very trees are knocking out people and breaking down machines. And that’s not all. A short while later, trees begin to grow. Everywhere. And very, very quickly. Foreseeing a time when tree growth will interrupt travel, deliveries, break into homes and stop power, the Drake family retrenches to the ecologically-sound and self-sustaining home of their grandparents. Here, among animals, crop planting and non-judgemental decision-making, they dig in for the end of the world as we or they know it. With the squeeze on the human race, used to shipping out food and far removed from its basic hunter-gatherer skills, violent gangs start to roam the island, looking for food and shelter, and society starts to break down into pockets of desperate households. How the Drake family survives is by collaborative effort and the use of intellectual wealth and power: the family chooses to scavenge for books on how to do things, make things and sort out problems. The book is a very middle-class manual of survival. What would the story have been for an equally pragmatic, but poorer family, with less education, but just as much drive to survive? The story requires the claustrophobic atmosphere of one homestead against the terrors of the new world, but it is this very preparedness that makes this less a fiction and more a manual of ‘how to.’ The book marks a triumphant ‘narrr narr!’ of the educated middle classes towards those who mock such aspirations. As an additional ‘bonus’ the family has a strain of Native American blood running through it: great-grandmother, grandmother and mother are all full- or part-blooded. And much of the ability to turn back to nature, to accept disaster but move on and get on and use one’s hands is ascribed to childhoods dunked in the spirituality/good sense/close to the land-ness of native peoples. While drunken, spiritually lost members of the family are mentioned, what about the thousands of Native Americans generations removed from their ‘oneness’ with mother earth? The dichotomy between the native sense of the family unit and the non-sense of the world around them seems a little over-simplistic in places. It is an intensely moral book about the mental and emotional challenges facing humans in a changing environment. Family Drake is remarkably good at meeting these challenges. After a few panics and tears, there is a lot of talking and reasoning-out. The three teenage children seem to turn remarkably smoothly into young adults—preternaturally so, as these had been social network-using, computer-loving modern kids. There is a distinct lack of selfishness in the family, and this is suggested as being the biggest failing of those left out in the wider world: that failing to let go, take on new challenges and think only of one’s immediate comforts, as opposed to one’s actual needs, will lead to gang violence and falling short of survival. Putting these themes together, it is worth focusing on one of the children: Mayanne. With a drunken, abusive father, she has lived for some time with the Drake children, her cousins. Of mixed race herself, she feels a confused and twisted sense of the ‘proper’ spirituality of her heritage. Frequently she retreats into a fantasy forest-based computer game, where as a powerful nymph she defends her forest from ogreish outsiders. Once the power dies, she does not have this to fall back on and is starting to show alarming signs of religious fervour towards real trees by the end of the book. She is what one might call the ‘interest’ character: a tragically ‘broken’ soul of an abused child, now having to face the new shock of a life very different from the one she was starting to get used to. As a comment on shock and the reaction of the mind, Mayanne is a sorely underused character. As a potentially disruptive and frightened creature, and a bewildered teenager to boot, she is exhibiting more the route down which outsiders have gone—developing extreme behaviours. Yet this is not explored fully. The adults hope it is ‘just a phase’ her confused self will go through, and emerge from, to be more like them at the end. Her cousin, as the respectable contrast, settles into her new life with a gallant heroism and undertakes a ‘proper’, traditional spirit quest to find her centre and inner strength. The two girls make an interesting contrast, which is not picked up on. As a disruptive element within the narrative’s familial unit, Mayanne could have made more of an impact in describing loss and trauma than the rest of the family, even after one of them is shot. If I have one biggish criticism of the book, it is this: this family just seems far too well-adjusted and adaptive. Possibly Tassie has offloaded a lot of her own knowledge, hopes and researched information into the book, and it acts, as I suggested above, more as a ’how to’, “In Case of Excessive Trees, Read This!” sort of thing. But while the Drakes survive, with decency and humility, hard lessons reached but with a general total co-operation, those who cannot adapt—the elderly, the fearful, the violent, i.e. the greater mass of people, one would assume, in a modern society removed from its animal, natural roots and in this situation—this mass becomes abhorrent by comparison. If gangs die, you do not mind because they have hurt others selfishly. Those who cannot adapt and are not roaming the territory with a gun become the pitiful and pathetic, the charity cases, soon to die and leave the stronger shoots of the better-prepared. While this is very likely the case in any great emergency, it is a callous idea to come up with while reading a book that is meant to show how good things can come from utter upheaval. This conclusion I came to, left something of a bitter taste. While emotions are described and laid before the reader, and there is worrying over family members far away, and someone is shot in the home during a raid and Richard Drake loses family close by, leading to a sea-burial, yet no one seems to truly develop or register these feelings in a longer sense. In the drive to survive, they are felt, and then curtailed. Again, this is sound practical sense, but while it is clear that Tassie knows her facts very well, she seems to know people less. The book is about one family’s survival, but it is the story of that survival. Even the sci-fi precursors in this type of disaster fiction allowed for more human depth to their characters; she has made them just a little too text-book for the purposes of fiction. It makes the book extremely dead-pan to read, and as such one is constantly feeling slightly lectured to by a more knowing mind. And yet… and yet… Funnily enough, by the end you are rooting (pun intended) for the trees—and, yes, for more people like this family: sensible, prepared, brave and curious. Tassie was raised ‘on an isolated homestead’ in British Columbia, and she apparently likes to take long walks along the shore to unwind. This is a woman with an inbuilt love of living things, and it would be easy to think this is her grandest statement on the subject: almost a wish for tomorrow’s future, one that is green, living, and taken out of the hands of selfish humans and into a bigger picture, where humans are once more a smaller number of threatened beings instead of presenting the greatest threat. As apocalypses go, it’s much more palatable than blowing the planet to hell, and aside from some issues over style, this was a solid and interesting read. Not for the shiny space-opera crowd, nor those who like a lot of melodrama, this is a thoughtful and moderately paced thought experiment. Speculation in every sense of the word.